Styled with milo sweater . See this in Wool-Cashmere Blend. Love this coat it goes with everything wether dressed up or in jeans and a t-shirt! Super soft wool that is a beautiful fit. Nice to have the collar open or button up for those cold days. Classy coat. Tons of compliments. The fit is flattering and I like the belt to define the waist. I went for the camel color size S and I love it! I initially ordered another jacket but decide to keep that one. The fabric is also very soft and comfortable. I would recomment! l liked the coat, it fits me perfectly and looks very warm! l like the length, style and quality of this Connor Wool Coat !! I love the material and colour! I had to get it altered but it’s what I do with most of my clothes! I’m overall happy with it!! I’ve been looking for the right coat for ages, and unfortunately throughout my search, I ended up wasting money on coats that I wasn’t even completely satisfied. Either it was too big or the material didn’t feel right or it wasn’t the perfect shade, and etc. I’m a short petite girl and it’s such a huge challenge to find something that fits me perfectly. I was tired of getting my coats altered yet not loving it. At first, I thought this coat was too expensive but after receiving my order, I realized I made the best decision and just bought myself an investment piece. It feels so soft and comfortable. It’s not heavy or bulky but suitable for the winter. The most surprising part was that it fitted me perfectly from everywhere. 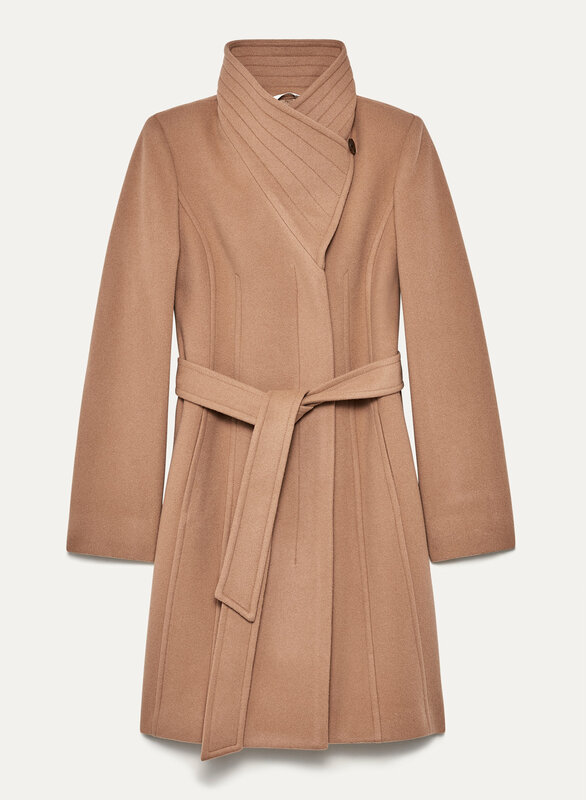 I love this coat so much and its beautiful, timeless colour (caramel shade) and shape. It works with every outfit and I’ve alreayd worn it so much!! I usually wear xs , not xxs for aritizia’s dresses and tops since they tend to be really fitted but I knew coats are always lose on me so I went xxs and it was a perfect fit. No alterations needed :) and my search is finally over!!!!! The belt is also another plus point. I’m not too fond of belts on coats so when I wear this one, I don’t usually tie it (or button my coat) but it actually gives a more defined shape to the waist if you tie it. This jacket is gorgeous! Length is great (5’3) & the colour is perfect. Love this coat. Bought it a bit bigger so I can wear thick sweaters under it. Worth the splurge. I bought the Row Red and am really enjoying it. it is wonderfully warm. A very well structured coat that drapes beautifully either open or closed (which is rare). The optionally high collar is gorgeous. I would buy every colour in this jacket but settled on the classic camel and rich red. For reference, I’m 5’8, 140 lbs with a D bust and size small fits perfectly. Fits perfect. Super soft, sleek design, not too heavy. I got the Heathered Grey looks great with everything! The red version of this coat is more of a yellow-red than the blue-red pictured. Think of a brick red. I still like it, so I'm keeping it, but just as an FYI to others. Fits well and looks great. It doesn't have some of the higher quality details that my previous Babaton coat had (no metal hanging loop or inside pocket). Anyways, glad I got it on sale! I ordered the red and I get nothing but compliments on it! This was a beautiful coat but was too large. The size chart indicated it should be the correct size for my proportions, but I would have actually needed one size smaller. 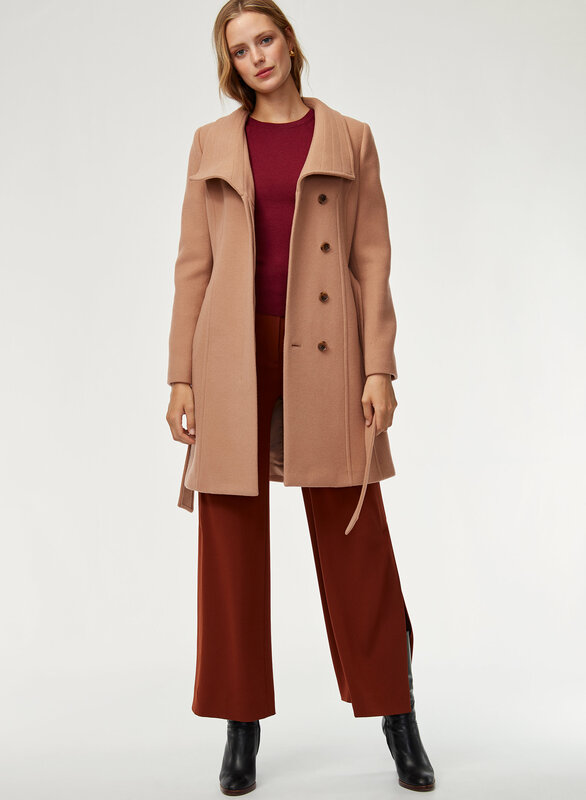 Have been on the hunt for a coat that is the right shade of red and looks sophisticated yet is also warm enough for NYC winters. I couldn’t be happier with this coat! Sized up to a Medium (normally wear a small in Babaton tops) which is perfect for fitting a sweater and scarf underneath. A little shorter length of arms. I was having a hard time finding a coat that was good quality and flattering on my small frame. I was surprised that the XXS was actually too tight on me, so if you're often sized out of clothes at the smaller end, you'll find your size for sure. For reference, I'm 5'4" 110 lb, not curvy, and the XS is a perfect fit. The fabric is wonderful, not at all scratchy, and I usually can't wear wool. It's not warm enough to wear all winter in Toronto, but will get you through in below-zero weather with warm layers and a scarf. My only complaint is that the belt is very thick and bulky and I can't find a nice way to tie it. I actually like the look without the belt, if it wasn't for the conspicuous belt loops. Another slight nit pick is that the buttons are hard to get to and to button up, but you get used to it somewhat over time. Overall very happy with my purchase. It looks sharp! I love it. Great fit, great weight, looks great too! My daughter absolutely loves the style and warmth. Classic tailored style. Warm and functional. This is a beautifully tailored coat with a silhouette that is flattering, feminine, and elegant. 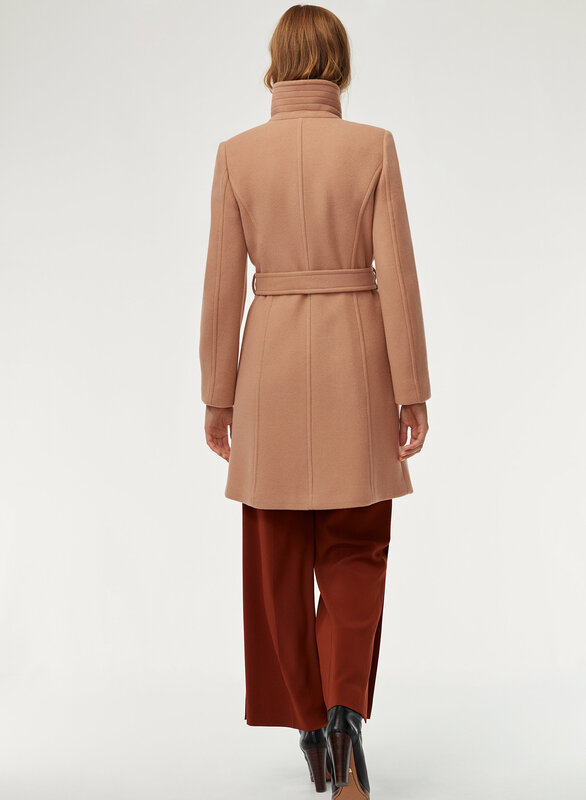 I've struggled in the past to find a wool coat that I didn't drown in, and fortunately this coat is slim fitted and offered in XXS, which is perfectly suited to my 5'3" 105lb frame. I bought the coat in the color Flirt and am so pleased with the color and the quality. Great length, fits perfectly for my shoulders and eveything. I bought the red version of this coat and love the colour, warmth and length of it! Elegant and beautiful. Love it! I ordered this gorgeous coat online, it arrived perfectly packaged. I would normally fit a medium but judging from the description it was a snug fitted coat so ordered a large. It fits perfectly and I love it! It's a beautiful jacket however not warm enough for -3 or below ..